MOCAP Long Flange Caps are designed to protect standard straight threads. The natural colour of the plastic flange caps allow for visual verification of the threads or o-ring. Flange caps for standard straight threads are easy to assemble or remove by hand or automated equipment. These Flanged Caps feature a longer length than our standard FCS Series flanged caps, adding extra protection for parts with increased thread length. Protects components or fittings from moisture, dust and damage during production, shipping and storage, and can also be used as low-temp masking during painting and plating. 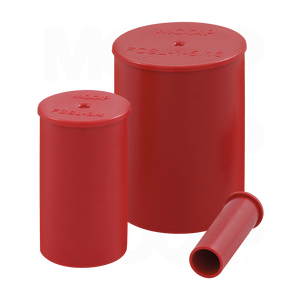 Our FCSL Series Caps are moulded in Natural polyethylene plastic and sized to cap Straight threads from 5/16" thru 1-7/8". Many Sizes of Our Long Flanged Caps for Straight Threads are Stocked for Immediate Shipment.